If you are setting off on your new GNU/Linux adventure, there are some must have things that you’ll be needing to take along with you. When you’re at the kitchen table packing that backpack for your big adventure, don’t forget to stuff these items in there with your lantern, matches, water purification pills, and lip balm. You’ll find this stuff will come in very handy along the trail. Linux, which specifically means the kernel portion of the operating system, was born in 1991 when Finnish student Linus Torvalds decided he wanted something to run on his 80386 processor based PC. Linus turned the code for his new kernel loose on USENET. Within a short while Softlanding Linux System (SLS) was born of a mating of Linus’ new kernel and Richard Stallman‘s GNU Operating System. The SLS project was taken over by Patrick Volkerding, who morphed it into Slackware Linux, the oldest still living GNU/Linux distribution. You can view the Linux family tree to see how things progressed from there. Sort entries alphabetically if none of -cftuvSUX nor –sort. …and the manual page for the ls command will magically appear. Cool, huh? You can also refer to that same manual page by using online websites that make that same information available to you. You can use Linux Man Pages, Linux Man Pages Online, or other similar sites. For some more in depth GNU/Linux documentation, you can check out The Linux Documentation Project (TLDP), LinuxDocs.org, or DistroWatch.com. The last provides brief synopses and reviews of most of the GNU/Linux distributions available today. If you clicked on that DistroWatch link above, you’d see that there are many, many GNU/Linux distributions out there in the world. While choice is a good thing, numerous choices can sometimes be overwhelming for new adventurers; what trail should I take? Every GNU/Linux advocate will have their own favorite list of distributions that they recommend to all the new adventurers they run across. Following is my list of the five easiest transition distributions. What’s a transition distribution? I define that as a GNU/Linux distribution that is easy to install and use right out of the box for new adventurers who are mostly used to using Microsoft Windows products. Ubuntu – this is the distro that took GNU/Linux from the desktops of geeks like me and put it on Gramps and Granny’s system. It did more to popularize the GNU/Linux operating system than any other distribution prior. Linux Mint – this distro from the land of Eire is slam packed with all the great stuff you’d want in an operating system. It’s good to go right out of the box. Mepis – while not the most popular GNU/Linux out there, this Debian-based distribution is a fine product, and most suitable for new adventurers. PCLinuxOS – this distro is a branch of the old and venerable Mandrake/Mandriva GNU/Linux. It’s easy to install and to operate. Ultimate Edition – this distribution gets its foundation from its Debian and Ubuntu roots. It is also easy to install and has loads and loads of useful software included the moment you boot up. Vector Linux – this excellent distribution is based on Slackware Linux. It is easy to install and use. OK, then. We have some history, some documentation, and a choice of distributions in our backpack now. We’re almost ready to begin the adventure. But wait! There are a few more very important items that we’ll be needing. Tutorials are documents that teach in a step-by-step fashion. They can cover a lot of information in a small space. They’re usually simplified so that amateurs and novices can follow along without the need to know the really complicated stuff underneath it all. Tips are just that; little tid-bits of information to make things go easier on your adventure. There was once a man called Bruno, he was my friend. He was also a serious GNU/Linux advocate and teacher. He selflessly spent many hours of his daily life teaching others about GNU/Linux. Many of us who knew him learned from him and were inspired by him to carry on his tradition of teaching. While Bruno may no longer be with us, part of the legacy he left us is his Tips for Linux Explorers site. Yes, some of the info there is a bit dated, but most of it is still very relevant and helpful. As far as tutorials go, there are many sites with wonderful GNU/Linux tutorials. Here are a few that I use regularly: The Linux Tutorial, YoLinux Tutorials, Linux Survival, HowtoForge, Tutorialized, and Linux Planet Tutorials. Believe me, if there’s something you want to accomplish within GNU/Linux, there is a tutorial somewhere that will show you how. Remember, when searching for answers to your GNU/Linux questions, Google is your friend. 5 Things Every Aspiring Linux User Should Know – another article that may be useful to new Linux Adventurers. The books listed below are somewhat advanced. I wouldn’t recommend that new Adventurers dive into them right off. Give yourself some time to climb a bit higher on that learning curve, then give these books below a peak or two. The more you experience GNU/Linux, the more the information in these books below will make sense to you. I put them here because they are excellent learning tools… when you reach that level. LINUX: Rute Users Tutorial and Exposition is the only Linux sysadmin’s guide proven by 50,000+ Web users. It presents in-depth coverage of all aspects of system administration: user management, security, networking, Internet services, packages, config files, shell scripting, and more. It also contains detailed cross-references to LPI and RHCE certification topics, making it invaluable for exam preparation. (description from Amazon.com) *This book is also available online in .pdf format. We come into this world alone and we leave it alone, but fortunately, while in this world, we have each other. Were it not for the GNU/Linux – Open Source community, there wouldn’t be any GNU/Linux; or if there were, it would be some ghastly thing used by a few uber-geeks in the darkness of night on their own desktop systems. Joyfully, that isn’t so because we have community; arguably the most important ingredient in the brewing pot. Scot’s Newsletter Forums – Bruno’s All Things Linux – a Linux support forum and much more. This site is run by Scot Finnie, Editor-in-chief of ComputerWorld.com. Jeremy’s LinuxQuestions.org – a Linux support forum and community dedicated to assisting adventurers of all skill levels and abilities. TechSupportGuy Forums – Linux and Unix – another excellent Linux community forum. The Linux Foundation’s Linux.com Community – a relatively new and growing community with many helpful members. Just Linux Forums – a great community resource. Linux Forums – search this place for great tips and assistance as you travel along in your adventure. Also, don’t forget… nearly every distribution of GNU/Linux has its own very helpful support community. Check out the main websites for links to their forums and such. All the distros mentioned above have their own forums. Check ’em out. Tux Machines – Susan Linton’s wonderful Linux community site. Linux Today – news you can use. Linux Insider – more informative Linux news. LXer Linux News – the world is talking about GNU/Linux and Free/Open Source Software. The above are just a sampling. There are literally hundreds of top level, informative Linux news sites on the Net. Search! Linux Operating System – Guillermo Garron’s very helpful and informative blog. Linuxaria – Ricardo Capecchi’s bi-lingual Everything About Linux blog. All About Linux – a self-professed “very” popular blog about Linux, Open Source, and Free Software. Linux Notes from Dark Duck – helpful information on choosing and running Linux on your systems. Dedoimedo – a place to learn a lot about a lot. A unique experience, I might add. There are many more sites out there, too. Each distribution usually has a handful of dedicated bloggers and teachers running from their own websites. Don’t forget to search online. You’ll find some wonderful stuff. First and foremost, GNU/Linux is NOT MS Windows. Please don’t expect it to be. Secondly, KEEP notes! You will find this an immeasurably important practice to discipline yourself into doing regularly. I don’t care if your notes are on your iPad or your main system or on a dead tree note book (my choice medium). Just keep notes. You won’t regret it. Lastly, but again NEVER last, the community is there for you. Take from it all that is offered, so that you can learn and expand your horizons on your great GNU/Linux adventure. We ask only one thing from you in return; when the time comes that you have reached a level of knowledge where you can comfortably (and accurately) do so, please give back to the community that supported you. This way there will always be those willing to help the new GNU/Linux Adventurers coming along the trail. P.S. I intend this document to be a living device. I will probably be amending it from time to time. a. added Megatotoro’s New to Linux? Here’s Your Hitchhiker’s Guide to Linux Forum Galaxy! Sometimes, we all have to look back down the path we’ve taken to more fully understand that path that lies ahead. I started my Linux Adventure a bit late in life. I’ve always had an interest in all things technical. My career for the majority of my working life was as an electronics technician (component level repair). I had aspirations at one time of gaining an engineering degree in electronics; other paths were taken, though. My first experience with computers and programming and such was in 1979-80, when I was attending tech school. We were trained on kit-made 8080A computers that were so primitive that they were programmed directly via octal machine code. The outputs of the machines were led light displays. This was ridiculously simplistic by today’s computing standards. I didn’t choose computers as my field of endeavor, though. I was much more interested in RF (radio frequency) and audio electronics. That decision probably made for a much different life than others would have. I regret lacking the vision that others had regarding the future of the computer. Hindsight shows me that I would have enjoyed a career in that field very much. 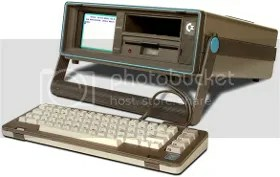 I did not have much interaction with computers from the early 80s till about 2000, with the exception of some fun times with a Commodore SX64 and some intriguing games from a company called Infocom. Oh, I had some experience with PC-type systems at the workplace in the early 90s, but I never really developed a passion for them. My current passion with computers and operating systems came about directly from my initial experiences with the Internet in 2000. Yeah, I was a little late coming to the party. I’ve been trying to catch up ever since. I have come a long way, though. I’ve been building my own systems since 2001 or so. I crossed over from MS Windows to GNU/Linux in 2006. I’m currently reading and learning all I can about the GNU/Linux operating system. I made some resolutions in the new year to learn more about specific Linux subjects; one in particular was shell scripting. I’m currently reading and experimenting with that now. I’m also publishing some basic lessons regarding this stuff as I go along. I learned a long time ago that a great method for learning is to learn by teaching. I have to research and learn something before I can write an article about it here. Whatever I learn, I like to pass on to others. That is the beating heart of the GNU/Linux Open Source community. I have learned so much from the selfless acts of others in this community that I am driven to give something back. It is a mission of mine to educate, to assist, to entertain, and to ease the transition of new Linux Adventurers into this wonderful community. I am no guru when it comes to Linux, but I have gained enough knowledge to get around without getting lost too often. I have much to learn yet, but when I do learn it, I’ll be here or somewhere helping others to learn it too. A man called Bruno inspired me. I would one day love to earn a living writing technical related articles or books regarding GNU/Linux. I would like to be employed in some fashion that would allow me to use my knowledge in a GNU/Linux business environment; as a systems administrator or a technical writer for some company or other. Sadly, my late-coming to the party and the fact that I’m no young spring chicken anymore has hindered my abilities to secure any positions like these. I’m totally self-taught and hold no industry certifications. I would love to attend school again to learn more in this field, but again… it doesn’t always work out that way. I’m not at all sure what my future path is going to be like. It’s a day-to-day thing right now. However, I will always be learning; and with any luck, I’ll always be here passing it along to you. I never shook his hand. I never heard his voice. I never even saw a photograph of him. My only visual connection with Bruno was his avatar that he used everywhere online. Yet, he was my friend. He was a friend to many. He was a mentor and teacher to even more. Bruno Knaapen of Amsterdam was a graphic artist by trade, but his first love was Linux. He was particularly enamored with Mandriva, for its ease of use; and Slackware, for its legendary stability. As far as I know, Bruno was self-taught. I don’t believe he had any formal training in Linux, yet he was a guru by any definition of that geek compliment. If Bruno didn’t know the answer to someone’s query, he would make it his mission to find the answer. He learned by teaching and taught by example. He ran numerous machines with numerous distributions of Linux installed on them. He experimented and tinkered continuously. He learned. He then passed his learning and experience on to anyone who asked. Bruno was probably the most selfless individual I have ever met. He seemed to thrive on teaching others what he knew. On a cool Saturday morning earlier this year, Bruno died in his home surrounded by his loved ones. He had been diagnosed just a few weeks previously with terminal cancer. He was fortunate enough to have the opportunity to say good bye to his family and friends. Most folks don’t get that option. I was very fortunate to have spent a month’s worth of late evenings/early mornings chatting with Bruno via email before he died. I saved every one of those emails. It’s only fitting that the very first post that I write here in this blog regarding Linux be about Bruno, the man who taught me a large portion of what I know about that topic. He was my friend. I miss him.